Always loved that song. Still gives me goosebumps. Having spent all of my life in the NYC metropolitan area, I love New York. While it has certainly changed a lot over the years from what it was in the 1970’s, it is still the capital of the world in my eyes. The energy. The electricity. The toughness. The passion. Everything is just bigger, crazier and louder in NYC. Having built my PR firm in both NYC and Jersey where I live, I know the city’s real estate market pretty well. That was my niche for almost 30 years! And the crazy thing about NYC is that the real estate sector is and always was the city’s dominant business. The biggest, richest, boldest entrepreneurs and executives were all in the real estate space. And they still are. But what’s really interesting about NYC these days is the thriving tech scene. And I don’t mean the overall tech scene, but the real estate tech scene. It’s where you will find the biggest, most successful tech companies, startups and a great majority of the investors and VCs. And it totally makes sense too. It’s where all of the largest real estate developers and brokerage firms are! So it is no surprise that we would find the startups surrounding these companies, knocking on their doors, servicing them with their technologies and raising money from them. At our San Francisco event, we largely focused on the tech community and tenant sector with our speakers. And that makes total sense. After all, San Francisco is dominated by tech and the largest tenants there are obviously tech. In NYC it’s different. It’s bricks and mortars. It’s real estate developers and brokers. They dominate the city. They have all the power. And the good news is, the leaders are investing in tech. And that’s going to be our focus for this event. We want the entire industry to hear from the leading owners/developers, from the CTO’s of the top brokerage firms and from the leading VC’s on how they see commercial real estate tech today and in the future. I can’t wait! I hope you will join me and my amazing team. Tickets are now on sale and we have many sponsorship opportunities available. 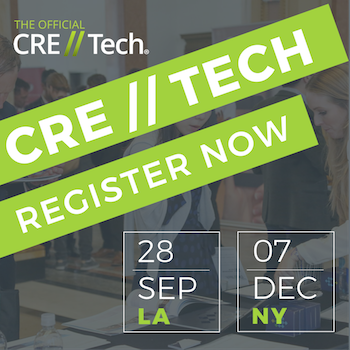 Don’t forget to come meet me in Los Angeles on September 28th and New York on December 7th for CRE // Tech! Tickets are on sale now!